I’m on vacation this week – somewhere off the coast of Florida on a cruise ship, maybe in Nassau, maybe in Orlando when you read this. But I didn’t want to let you down, so I wrote this a few days earlier, and instructed WordPress to publish it in my absence. Here’s a photograph taken by one of our astronauts – I’m not sure exactly who – but it was taken with a hand held camera, for God’s sake! This version has been digitally restored – the original is faded and scratched. It’s absolutely beautiful. I was just a kid living in Dayton, Ohio when the Apollo space missions were taking place – so I think I’m in this photograph. Ohio would be under that cloud that appears to have formed over the Great Lakes, top and center of the picture. Dayton would represent an area about as big as the period at the end of this sentence. The greater Dayton area comprising around a quarter of a million people at that time – well, I’d be the equivalent to a proton or electron in this picture. Viking 2 was circling the planet of Mars in 1975. It turned back to take a picture of Earth – mind you Mars is the closest planet to Earth, yet far enough away that travelling there is still the stuff of science fiction. Here’s the photo that NASA released, the first to be taken from a position further than our moon. 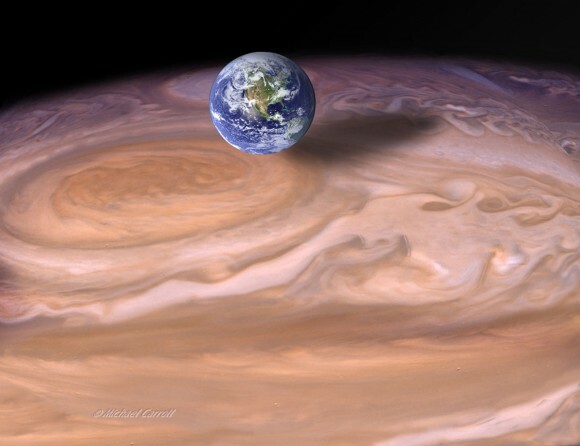 I can’t find a photo of the Earth from the vantage point of Jupiter, but here’s a great computer generated photo from NASA of what Jupiter and the Earth might look like side by side. Again, awe-inspiring. In 1990, Voyager 1, which had been launched in 1977, reached the edge of our solar system – our solar system, mind you, not our galaxy, not our quadrant. At the request of Carl Sagan, NASA ordered Voyager to turn around and take a photograph of the planets of our solar system. Here’s the amazing photo of Earth it took, from the vantage point of just beyond Pluto. Now notice, for one thing, how I have to provide a much larger photo this time to see anything at all. 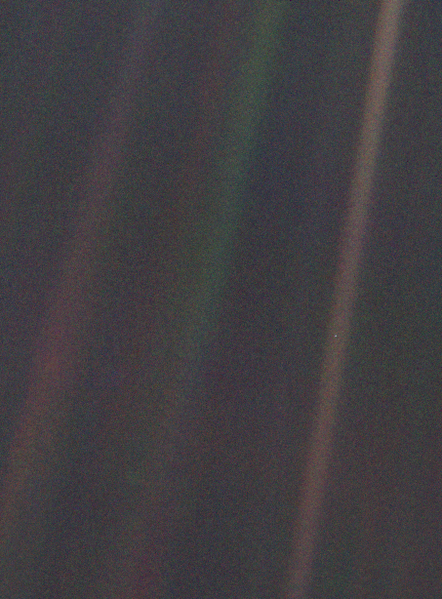 Focus on the brownish band on the right third of the photo, half way down – you’ll see a pale blue dot. That’s us. If you’re measuring in pixels, NASA says it’s 1/12th of a pixel. Maybe you have a fairly nice, flat-screen TV, with 1080 HD capability. 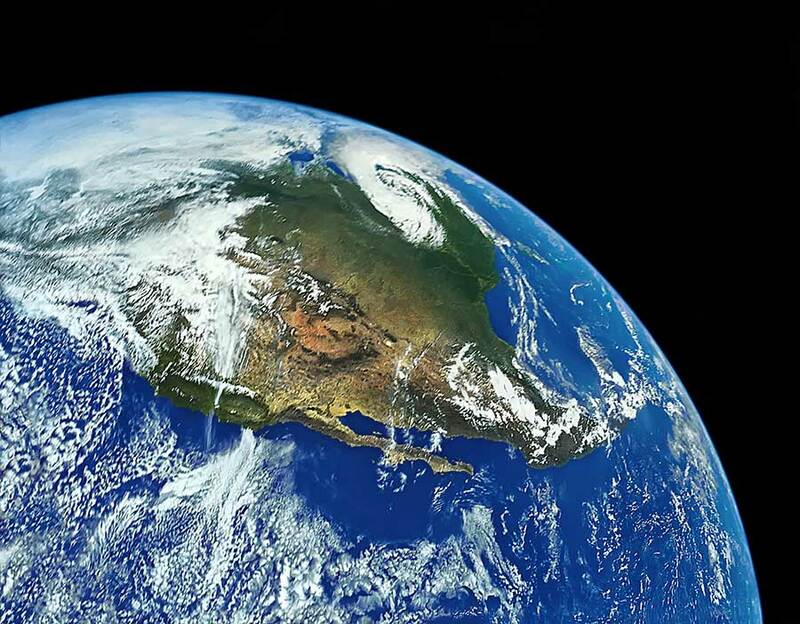 Magnify your screen by about 11 times, and the Earth would occupy just one pixel on your now gigantic TV screen. When I was a believer, I thought that heaven was at the center of the universe, perhaps a planet or star around which everything else in the universe revolved. 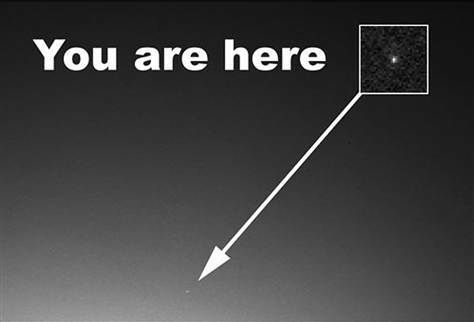 If Earth is a speck of dust on a grainy photo from the perspective of Pluto, what would be its significance from the center of the universe? My brother has often postulated that, if God exists, might Earth be the ant farm he made for his 4th grade science project, now forgotten and abandoned in the back of his closet? Compare this to the Aristotelian conception of the universe, which would have been the model accepted by the writers of the New Testament. Notice that Earth is not a speck at all; instead, it is the largest object in the picture, situated at the center, dominating every other celestial body. Is it any wonder that, the more we are able to see and perceive, the less sure we are of God’s existence? When we find out that the church was wrong about the simple, physical facts of the universe, the less trusting we are that it has a fix on the much more complex spiritual and metaphysical answers as well. Finally, if you really want to get some perspective, look at some photos of how Earth measures up in galactic terms here. Please don’t tell me you see the majesty of God in these photographs; if anything, these pictures reveal how ridiculous our religious ideas are – not only are we not the hot topic of the universe, our cumulative human experience doesn’t account for a single tick on the celestial time clock of the universe. As we learn more about our galaxy , I marvel at the creation of God. Man with all his complexity cannot be an accident, for we are wonderfully made for eternity. If I am wrong,so what.But if I am right,joy and my wife await me. made for eternity would be easy to debate since we are obviously are, to borrow a term, ‘designed’ to expire. there’s always room for all of us to be wrong, but “so what” might not apply to an idea as corrosive as religion. plus i wouldn’t want to go around converting people based on ‘IF’. sounds like imaginary life insurance. we could ALL be wrong and the vikings correct. surely thor is furious at our rejection. on a lighter note….if i’ve been married three times, will i have to tolerate all of them in heaven? or just the one i liked? if they’ve remarried, will we all have to share a mansion like on the TV show Dallas? would probably produce similar results. just a thought. One question first: That picture with the earth so large wasn’t drawn by Aristotle, right? So, who drew it and why did the artist make the earth so big? What reason does he have to thing that people did think the earth was that big? Hopefully you can satisfy my curiosity. The scale of this drawing accurately represents his idea, although the scales for size and distance are not the same, much like a model you’d see in a classroom. You can search for other images such as Prolemy’s and see the same thing. But that begs a similar question in my mind – Jesus spoke 2000 years ago, but never wrote a thing. How can we be sure the New Testament accurately portrays him? Can I get a quote from him that shows his view? That would be helpful. I suppose we can find out if the new testament accurately portrays him the way we figure out such things for other historical figures, whatever that is. I wish we could look at Jesus the same way we look at other historical figures. The problem is that he wrote nothing himself, and we have actually very little written about him by contemporaries. The letters of 1 Peter and James seem to be written by two people who walked with him when he was alive – but all the other writings are either dubious or second hand accounts. Many have felt through the centuries that the historical Jesus is mis-represented by the scriptures – Thomas Jefferson is one of the more famous examples. So many people feel that the historical accounts misrepresent Jesus. They presumably have some evidence to support those feelings. It does not help that the gospels, two of which claim to be written by followers, a third by a historian who they say did a very good job and the fought by a follower of a follower are unreliable. Some are dubious and some are second hand (which automatically disqualifies them). 2. I have reason to trust Luke as a historian. 3. I do not reason from ‘the portrayal of Jesus is accurate’ to ‘Christianity is true’. Yet. I was simply responding to your idea that we should treat Jesus like any other historical figure when we’re trying to figure out who he really was. The truth is – we don’t, and your comment illustrates that fact. For example, you say you trust Luke as a historian. What were his credentials? What other histories did he write? Even the Bible provides no support for Luke, only tradition – Luke’s name was attached to the gospel of that name 150 years after it was written. So if you want to say you believe it, no one is stopping you, but don’t say you’ve subjected it to the same logical criticism that you would any other historical document. Your third point is just completely illogical. If Christianity being true is not based on Jesus being who the scriptures say he is – then God help you. You don’t have firm footing on any level now, faith or reason. First, I’ll make a clarification. My third point was not that Christianity being true is not based on Jesus being who the gospels say he is. It was that I did not reason to the conclusion that Christian is true using that path. I reached the conclusion that Christianity is true through other means. I am pleased to get a glimpse into your methods of historical inquiry. Now I’ll just get out of here, thank you for this discussion. So, no quote from Aristotle. I’ll just ignore the drawing then. Again, thank you for illustrating the willful ignorance so common to American Christians. I don’t give you a quote, so you disregard information that has been common knowledge for 2500 years. Yet you build your life upon a collection of documents of dubious authorship and authority. Aristotle wrote hundreds of volumes of ideas and opinions. His views of the solar system are not obscure knowledge, however. I learned of this model when I was in junior high school – I suppose they are too busy teaching intelligent design or some other drivel these days to include such things. He guessed the size of the moon accurately, but believed the sun and planets to be much smaller than the earth itself. His geocentric cosmology comes from a work entitled ‘Metaphysics’ – I’m sure you can find a copy online. 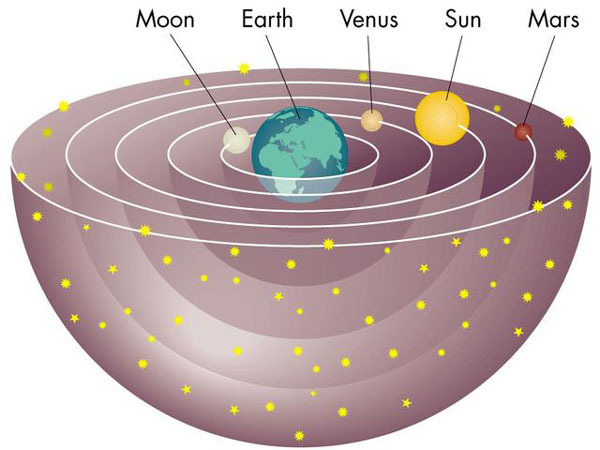 Or if it’s the image that you doubt, have a look at http://en.wikipedia.org/wiki/Geocentric_model for starters, where you can see many other similar ones. There’s no need to be mean. It has been my experience that people often make claims (or produce drawings) for which they have no support. So, when I am presented with a claim of which I was previously unfamiliar and which does not seem intuitive, I request some sort of support for it. If I can find none, I ignore it. Suggesting that I am willfully ignorant because I refuse to believe information for which you provide me no support is a tad quick, don’t you think. I took 15 subjects in Junior secondary school and in Senior secondary, I had to prepare for 3 different exams using 3 different syllabi. Sadly, this left little time for studying Aristotle and Intelligent design. Tracy, I wasn’t trying to be mean. I thought everyone – everyone – knew that people used to think that the Earth was the center of the universe, and now they don’t. Something about the scale of the drawing seemed to bother you, but that’s minute compared to the main thrust of the argument. All of the writers of the New Testament held a concept in their minds that was grossly incorrect. To disregard something because others won’t do the heavy lifting for you – well that’s why people listen to priests and prophets – sorry if that offends. Now you could say that it wasn’t God’s will to explain the mysteries of the physical universe to them, that the Spirit’s main intention was to inform them of how to please God and get to heaven in the next life. OK, no problem. But if that’s true, let’s use the Bible as a guide for spiritual things – and leave it out of our discussions of education, science, government, and civic life. Of course you embrace your religion through means other than reason – reason will not lead you there. Why try to justify your beliefs rationally at all? I think thoughtful Christians have to feel a tension between what they believe and what is logical, and therefore they feel a need to justify their beliefs through some means. And ‘my’ methods of historical inquiry are not mine – first day in a college level history class will teach you that historians search for primary sources when they want the most reliable information, and secondary sources only when they can’t obtain the former. 1. I am quite happy to do my own research when it is an issue that I deem both important and of interest to me. However, when someone makes a claim, I think they should be able to provide support for it. If they will not, and I do not find the claim interesting enough to investigate myself, I let it be. What was that point about people listening to priests about? Is it supposed to be important to me? 2. I understand your claim that the writers of the Bible believed something that was false. I also probably believe some false things. Unless you are arguing that some of these beliefs are presented in the Bible as true (not just as someone’s opinion), I do not know how your point is important. Pardon me, but how did you reach that conclusion? I said that I did not first believe that the Bible presents Jesus as reliable, and then conclude that Christianity is true. I reached the conclusion that God exists by surveying the world around me and judging that it has a creator. Then I judged that Christianity (as presented in the Bible) is in harmony with what I know of this God and so I concluded that Christianity as presented in the Bible is true. I did not reason by saying, “the Bible’s portrayal of Jesus is accurate and then somehow conclude that this makes Christianity true (how would someone do that, anyway?) Pray tell, how exactly does that show that I embraced my religion through means other than reason? 4. When I spoke of your methods of historical inquiry, I was not referring to your desire for primary sources, but your suggestion the manner in which you treat the sources that you do have. To save you from further misunderstanding me, I was referring to your emphasis on when Luke was judged as the author of the accounts that bear his name, the question of whether he wrote anything else, your contention that the other accounts are either dubious or second hand and the fact that you still haven”t provided me reason to think that the accounts unreliably portray Jesus (unless those are your reasons and then, God help me, I reason in a quite different manner). Are you always this uncharitable to commenter on your blog or do you merely have a problem with me? Accusing me of being willfully ignorant and unreasonable, irrational and ignorant of the established methods of historical inquiry on the same post is too much, don’t you think? Tracy, you’re right – I’ve been uncharitable, and for that I apologize. 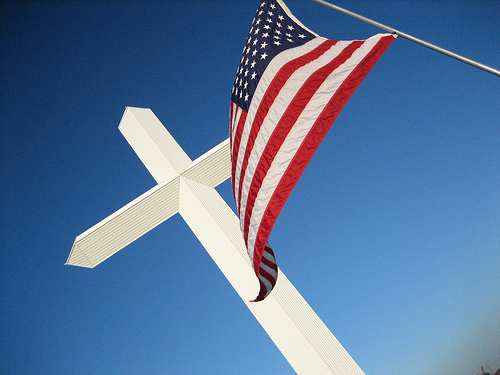 And no, it’s not just you – I am frustrated by the fact that most Christians have a very fuzzy idea of why they believe what they believe, yet they want to force those ideas on everyone. I’m distressed that every Christian blogger is saying exactly the same things – no gay marriage, more guns, less taxes, more Republicans, etc. It seemed to me that you were quick to dismiss a small point in my post, and thereby dismiss my whole argument. I’m sorry if I hurt your feelings or caused you any distress – we should all be allowed to voice our ideas. I lived in China for a decade, and I’m frustrated to see that country improving by leaps and bounds, while ours stagnates. I feel a lot of the reason that we’re declining is because we’re the most religious of all western countries. When I see posts like the one on Southern Humanist’s site – http://southernhumanist.wordpress.com/2012/06/19/north-carolina-moves-to-outlaw-disagreeable-climate-science/ – I fear that the ancient ideas in the heads of many Americans will keep us from solving some or our very real problems. Sorry if I took out too much of that frustration on you. I hope you’ll keep reading and posting. And I can relate. All the atheist bloggers I read say mostly the same things too. i’m still astonished how people look at the world around them and ‘reason’ that it must be due to a magic man in the sky. the inside of my computer is complicated and outside of my understanding; i don’t assume that athena made it. i think it’s a combination of species with an over-active ego…”this must be all about us”… and a desire for easy answers. add to that being taught this stuff by our parents from birth, and i guess it’s a powerful spell. it’s a bit funny as well that people just swallow the incredible claims in the bible with no further research. but tell ’em aristotle thought earth was the center of the solar system and you’ve gotta take them to the library or get aristotle to ring their cell phone.